Sailing Together or Ships Passing in the Night? 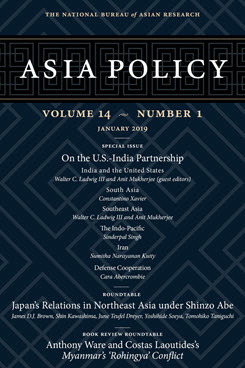 This article examines the significant congruence of U.S. and Indian interests in Southeast Asia and assesses both the prospects and constraints that New Delhi and Washington face in coordinating their policies toward the region. Political leaders and analysts have described U.S.-India relations as a global partnership with the potential to shape the future security architecture of the Indo-Pacific. As is widely acknowledged, the two countries’ extraregional interests align most closely in Southeast Asia. Accordingly, this article examines the potential for and limitations of U.S. and Indian cooperation in the region to achieve shared aims. Extensive diplomatic consultations between the two countries have led to a significant convergence in their positions on regional security challenges. Active cooperation, however, remains constrained by a number of factors, including India’s need to prioritize foreign policy challenges closer to home, concerns about provoking China, and a discomfort among countries in Southeast Asia regarding the idea of a joint U.S.-India approach toward the region. Due to these limitations, U.S.-India policies in Southeast Asia are expected to continue to operate in parallel instead of becoming a joint endeavor. The U.S. and India, which are at the initial stages of a cooperative approach to Southeast Asia, should intensify their diplomatic and military exchanges and establish a dedicated forum to share views and information on political and security developments in the region. Strengthening the regional security architecture should be a major focus of Indo-U.S. efforts in Southeast Asia. In particular, they should concentrate on assisting the creation of a region-wide maritime domain awareness system, as well as working in parallel to develop the capacity of partner militaries. Connectivity and infrastructure projects should be a renewed focus of Indian and U.S. efforts in the region, in partnership with like-minded third countries such as Japan. Walter C. Ladwig III is an Associate Professor of International Relations in the Department of War Studies at King’s College London. He is the author of The Forgotten Front: Patron-Client Relationships in Counterinsurgency (2017). Anit Mukherjee is an Assistant Professor at the S. Rajaratnam School of International Studies (RSIS) at Nanyang Technological University in Singapore.